Hey folks, a happy 2018 to everyone from myself (Wahn) and the rest of the FS Team. Hope you have a great time in this new year. 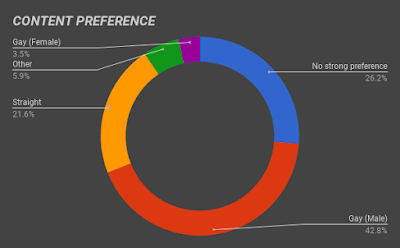 The preferences poll had over a thousand responses, and through those, we've learned a good deal about our community! More than half of you play as a male PC, with female PC's being second, closely followed by herm PC's! 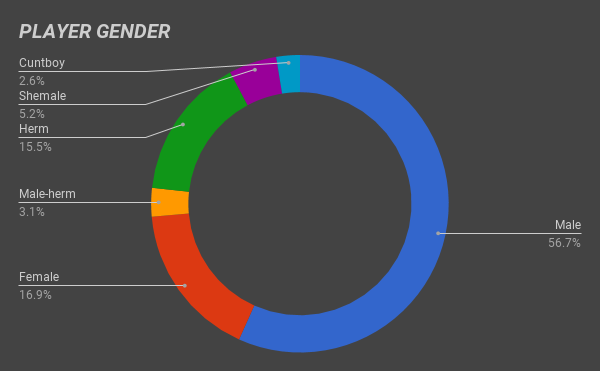 Also, I did see a few requests to make the genders checkboxes, however the poll was to gauge what is most commonly played. As such, we thought it best to keep it as a single selection. The majority of you prefer M/M content, and a good size of you don't have any strong preference. There's also a 21% preference for straight content! The really interesting result here though (to me, at least), is that more people prefer content involving tentacles and other hard-to-classify things than F/F content. This one is an interesting one! The results lean heavily towards submissive players, with a strong liking for ferals and knotting! Master / Pet is also highly liked, as are other forms of domineering content.